There are many common causes of homelessness. For some these include illness or injury; others lose housing through abuse, abandonment or divorce. A few tenants pay move-in costs only to discover housing that is uninhabitable or terms that change once they part with their money. And yes, there are individuals with a history of court involvement or addictive behaviors that can be persistent barriers. For any of the above lucky enough to find steady work, there are other hurdles. Poor credit, eviction for non payment or other lease violations can prevent their applications from even being considered. And that doesn't even take into account the widening gap between housing costs and wages. Housing can be made affordable one of two ways: by increasing wages to reflect the price of local housing or by creating housing that is affordable to a range of local wage earners. At the start of 2015 the average rent for a one-bedroom unit was $631, compared to a two-bedroom rent average of $721. (source, Idaho Statesman). A full-time minimum wage earner in Idaho grosses approximately $1,200/month, meaning the average low-income renter is extremely housing burdened, or paying more than 50% of household income for housing costs. HUD considers housing costs that exceed 30% of household income as unsustainable, meaning tenants fall farther behind each month. Rental vacancy rates in the Treasure Valley have been at historic lows in the years following the recession, hovering between 1.5% and 3%, compared to a normal rate of 5% to 7%. Low rental vacancy rates generally push rents up, which means housing providers can choose tenants with the best credit score and rental references. This puts housing out of reach for many Idahoans living paycheck-to-paycheck or who have compromised credit histories. The housing market crash and resulting recession displaced millions of Americans through foreclosure, but it also left many renters high and dry. Renters who signed leases in good faith, shelled out first and last month's rent—plus a security deposit—then paid their rents on time found themselves evicted when landlords lost their properties to foreclosure. At the same time, credit all but dried up as lenders panicked and stopped the flow of funds to develop new housing stock. 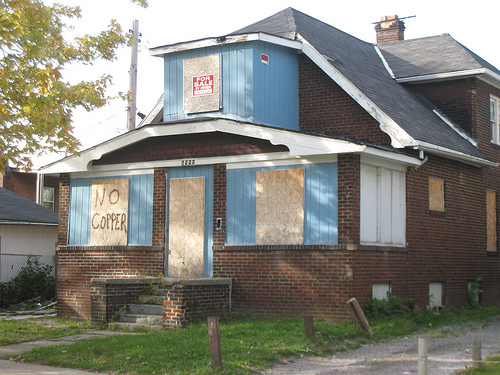 Vacant foreclosures can drain local budgets. As foreclosures mounted, savvy international investors bought up distressed real estate and held it outside the rental market, creating an imbalance in supply and demand and a burden on local code and law enforcement budgets. Ripple effects of the subprime meltdown reached beyond homeowners and renters as employers laid off workers or cut back hours, while pension funds lost value. The result is that more U.S. cities and households are still coping with the aftermath of the recession, even as the economy recovers. Despite credit flowing once again, most builders and developers set their sites on upscale apartments and condos. Boise has multiple residential developments underway or planned, but few will have rents much lower than $1,000/month. The mass eviction in 2015 at the Glenbrook Apartments sent shock waves through the local market community as over 100 tenants—many of them refugees or others on fixed incomes, received 30-day notices or were told their leases would not be renewed. This put pressure on an already tight rental market. Tragically, it also means the disruption of neighbors and families that had come to rely on one another as a supportive network. 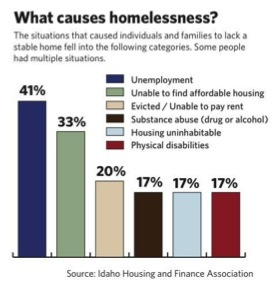 A strategy to create more permanently affordable housing throughout the city would help Boise lessen the impact of such events, and limit the accompanying instability and stress on families and neighborhoods. This is easier said than done, but where there is political will and a recognition of the value of a diverse housing market, change happens.